Growing fruit varieties isn’t predictable. For example, all apple trees are the same species. If you plant a seed the chances of getting the same variety as the seed came from aren’t large. Grafting can revitalize an old tree. If your fruit tree is getting past its best, and not delivering good crops any more, you can give it a new lease of life by creating healthy new branches. Want more variety? If you’d like to have a choice of varieties, but you don’t have room for an orchard, grafting can give you a custom tree. Yes, you can have several varieties of fruit growing on one tree. 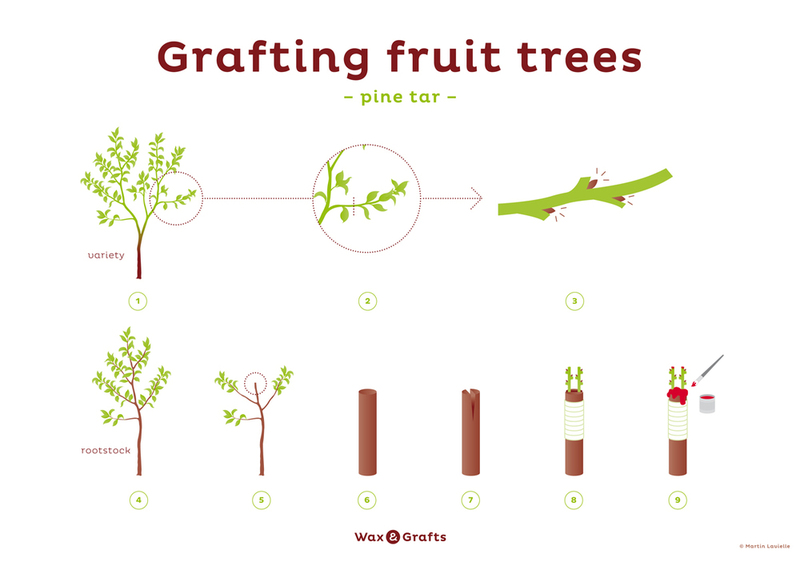 The principle behind grafting isn’t too complicated. If you can attach a living piece from one tree onto another one, and protect it long enough, it will bond with the host tree and become part of it – but keep its own characteristics. A Red Delicious branch grafted to a Pink Lady tree will keep producing Red Delicious apples. Persuading two separate organisms to become one does take some time and effort, but the good news is that it’s not all that complicated. Of course you’ll also need an appropriate tree and living samples! The material you graft on to the host plant is called a scion, and it’s important to select it carefully. You have to make sure that the piece you choose is healthy and free of disease – otherwise it will fail, and could easily infect the host – and that it’s the right size for the location you’ve chosen. It’s also important to do your graft at the right time. For it to succeed you want both plants to have “slipping” bark – this is the stage where the bark can be removed quite easily, revealing the green sapwood below. It’s usually easiest to do this in spring, which also gives you a full growing season for the graft to establish itself. To graft a fruit tree one of the most reliable methods is T-budding. As the name suggests you start with a bud, not a branch. To create your scion select a bud on the donor tree; with a very sharp knife start a cut half an inch below it and carve the bud out of the tree. Make sure you cut deep enough to expose the green layer below the bark; this is where the two halves of the graft will unite. The cut should extend to about three-quarters of an inch above the bud. Once you have your scion wrap it in a damp paper towel and store it in a plastic bag; if it dries out before you transplant it the graft will probably fail. Now choose a good spot on the host tree. Ideally you want to graft to a branch – or sapling – that’s between a quarter and one inch in diameter, and find a place as far from any existing buds as possible. If necessary trim away any buds within six to eight inches of the graft site. Next, make a vertical cut about an inch long where you want to place the bud. Don’t cut deeper than necessary, but you need to go through the bark to the green layer. At the top of it make a horizontal cut a third of the way round the branch or trunk – you’ve created your T. Now carefully use the knife to lift the bark either side of the T’s stem, raising the flaps to reveal a triangle of sapwood. Unwrap the scion and make sure both it and the graft site are clean. Now slip the scion into the cut, as far down as it will go; the flaps of bark should hold it in place. Trim away any of the scion’s bark that sticks out the top of the T and neaten things up as much as you can. It’s now in place, but to ensure it takes hold and grows strongly you need to fix it securely for a while. Use electrical tape or rubber budding strips for this, being careful not to disturb the scion. After about a month check your graft. If the strips or tape haven’t fallen off remove them. If all’s gone well the scion should have bonded with the tree and the bud should look healthy. If it’s dried and shriveled it may have died, and you’ll have to repeat the process. Otherwise just keep checking on it. By next spring the bud should be sprouting leaves. Now it’s time for the final stage. Make a sloped cut through the branch about half an inch above the bud, and cut away any other shoots below it. Now the bud will be able to use the full nourishment of the branch, giving it a good start. There are other ways to graft, too, but they all use the same basic principles. For a chip bud – also popular with fruit trees – cut a scion in the same way, but instead of making a T cut slice away a section of the host’s bark about the same size as the scion – the closer to matching the size, the better. Notch the bottom of it so the transplanted bud with be held in place, then fit the scion into the cut and trim until the green areas of both are as well matched as possible. Bind with tape or rubber and wait to see what happens. You can even graft a whole branch onto the stub of another. Choose a young, relatively thin branch and find a spot on the rootstock that’s the same diameter. Cut the ends of both in a matching zigzag line to give the maximum contact area, fit them together and secure them with tape. If you get a lot of wind use a splint to hold the two pieces until they grow together. Grafting isn’t all that hard, and the results are well worth the effort. If you want to get the most from your fruit trees it’s almost certainly something you’ll have to do, but now you know how. The key things to remember are to avoid getting the graft dirty, secure it properly for the first month and keep things neat. Get it right and you’ll be able to create exactly the fruit trees you want.